One plant made the choice to make their own hose assemblies. This plant was installing new storage tanks and loading stations. Traditionally, these were connected via hard piping. However, by choosing to use hose, they would save time as well as labor costs. Buying hose, couplings and clamps in bulk would also save money. This system would also give the plant the flexibility of having a new assembly ready in a few minutes if needed, especially with their round-the-clock schedule. According to the plant manager, any worker who can hold a wrench and tighten a few bolts can be a certified pipe fitter. Fast forward six months. Ten assemblies that the plant made to connect the storage tanks to the loading stations began leaking. The plant manager called the distributor that he bought the hose and fittings from to complain about the inferior products they had sold them. He also wanted to know what they were going to do about fixing this situation and how quickly it would be repaired. The distributor salesman met with the plant manager and their safety engineer. A Dixon salesman also attended the meeting because the couplings and clamps were made by Dixon. During the examination of the leaking assemblies, the Dixon salesman discovered that the bolts in each of the clamps were not tightened to the torque specified in the Dixon catalog. In fact, the bolts were less than half the recommended torque value. The question was asked, “When was the last time someone here at the plant retightened the clamp bolts?” The plant manager replied that his staff never had to retighten anything once it was installed. • Select the proper clamp based on inside and outside diameter of hose. • Ensure even showing of hose between the clamp sections. • Tighten bolts to recommended torque. • Know that bolts are designed to bend. • Know that clamps are designed to bend. • Allow the individual body sections of the clamp to touch. • Replace bolts with bolts of any other strength. At this point, the Dixon salesman explained “cold flow,” a process of bolt tightening sequence, clamp selection, hose measurement and other items that ensure the proper selecting, installing and maintaining of an industrial hose assembly. After listening to the cold flow explanation, the safety engineer asked the distributor salesman why he was not informed of all of this when these products were purchased. The distributor salesman replied: “You told me that you had certified pipe fitters at your plant and that putting together a hose assembly would be child’s play for them.” The safety engineer began to realize that not knowing all the facts of making industrial hose assemblies could be far costlier than whatever money was saved by doing it themselves. He also learned to let the “experts” at the distributor do what they do best; make industrial hose assemblies. Choices. We all have to make them. 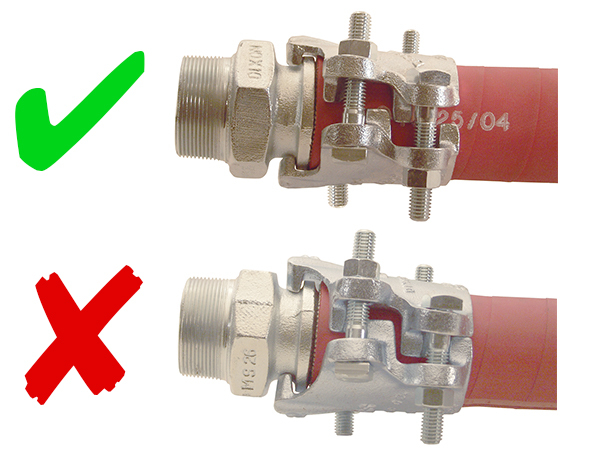 Make yours with “The Right Connection.” If you choose to make your own hose assemblies, be sure to follow the assembly recommendations of the hose and fitting manufacturers.